I waited this morning for a boat to come up through the locks so that they could leave the gates open for me. The boats in question are from the Nottingham City Council Adventure Team and two boat loads of children enjoying themselves. Down through the lock and after half an hour or so I arrived at Aston Locks to discover that the locks were not in use due to an accident. It was first thought that it was a missing person. 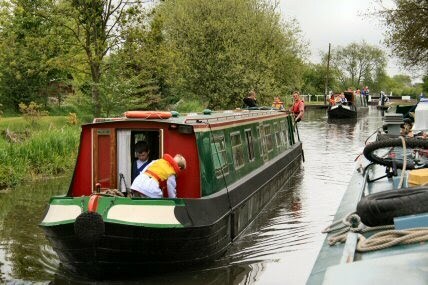 A boat about to enter the lock had set someone down to operate the gates when there was a problem. 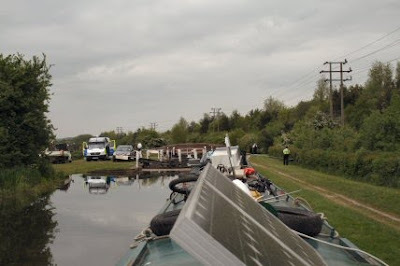 The person on land went back and there was no-one on the boat and the engine was going astern. Eventually divers were brought in and the canal searched. 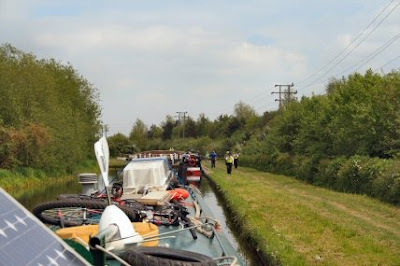 After several hours the body had been found and the Police carried out an investigation. The Police tape stopping people from entering the area was removed at about 1930 by which time it was a bit late to move in case there was no moorings left further down. As I am moored on the bollards set aside for the lock it will mean an early start tomorrow. I heard the air ambulance had been seen there. Sounds like a sad story. Poor person.